Hordes of freeride fans flooded the Audi viewing area. Pulsing music and alcoholic drinks —shoutout to the tasty FWT/White Frontier crossover beers—blanketed the spectator area, where the masses gathered to take in the Freeride World Tour finals on Verbier’s Bec des Rosses and the Freeride Junior Tour competition on the adjacent “Baby Bec” face. Conditions on the Bec were variable, with pockets of different types of snow scattered through the face. “It was so variable. It changed from chalky to about six centimeters compact, to like that sloughed-out chalk snow,” reported competitor Tom Peiffer. Despite the variable snow, riders were able to overcome with huge cliffs, speed, and style. Snowboard women opened the show. Marion Haerty had already claimed the title of FWT champion on points, but dominated the field anyway, combining flawless airs and rotations to win both the Verbier Xtreme and the 2019 FWT Snowboard Women’s overall title. Following the snowboard women, the ski women took their shot at the Bec. From the same start houses, the ski women teed off. Hazel Josie Birnbaum lead the pack, skiing strong through the central couloir below Start B, and airing clean off the exit cliff. From there, she stacked two more technical cliffs towards the lower part of the Bec. Hazel’s control, solid airs, and strong skiing earned her third on the run. Swiss local Elizabeth Gerrizen kicked out from the B Start and charged down the main couloir, launching a cliff to exit the couloir. From there, she linked smooth skiing with more airs, including a monstrous final cliff towards the bottom of the Bec. Gerrizen’s combination of speed and airs netted her the top spot. The predominantly Swiss viewing crowd erupted in applause when she clinched the win, and took the top step of the podium. Jacqueline Pollard took a unique line, combining a top air with a traverse out of the central couloir, and a new cliff on the skier’s right side of the venue, and closed out her run with a few smaller hits. Hedging Wessel followed a similar track, again traversing out the exit to the central couloir, and popping off a cliff even further skier’s right. Despite the new cliffs, both women lost points on fluidity. Fresh off her victory in Andorra, Jackie Passo came out swinging. She combined a cliff near the top of a couloir with a massive exit air. However, as she traversed to kill speed and regain control, she high-sided and crashed. The last woman, Arianna Tricomi took a playful, unique line through the looker’s right side. No other ski women athletes had skied in the area, or even utilized the Start A, instead opting for the Start B on top of a couloir. Arianna combined two cliffs up top, and the same final air as Elizabeth Gerrizen. The unique line and strong airs put Ariana in second for the Verbier Xtreme, and secured her the FWT 2019 overall title. After the slough settled, the ski women’s Verbier Xtreme podium presented Hazel Birnbaum in third, Arianna Tricomi in second and Elizabeth Gerrizen in first. In the overall rankings, Gerrizen skied to third place, while American rookie Jacqueline Pollard landed in second for the season and Tricomi claimed her second consecutive FWT title. After their runs, the athletes joined the spectators in the viewing area, signing autographs, grabbing drinks and taking photographs with fans. Snowboard men followed the ski women, where points leader Victor de la Rue was able to hold off the field and cement himself as the FWT 2019 Men’s Snowboard champion with a third place finish. On the Ski Men’s side, Wadeck Gorak laid the gauntlet down from the first run. 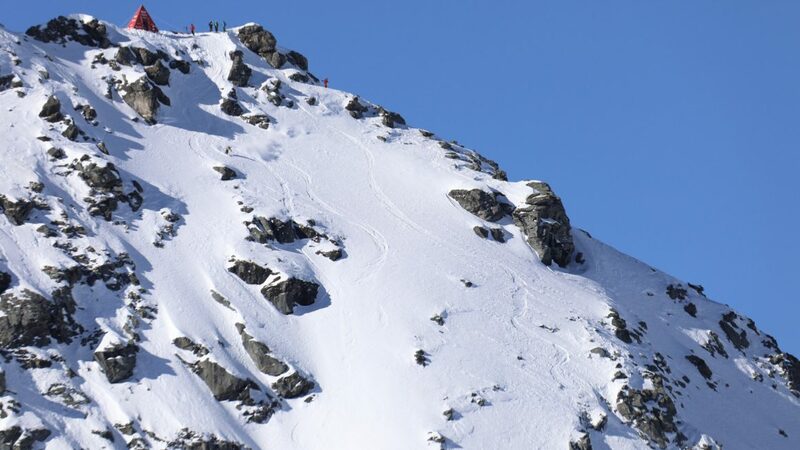 From Start 2, Wadeck ripped through Central Couloir and launched the exit air. He followed with a sizable cliff in the middle section, then an obscenely large backflip on his final feature. His run was only a few seconds long, charging from start to finish with no hesitation between technical exit airs and huge freestyle tricks. 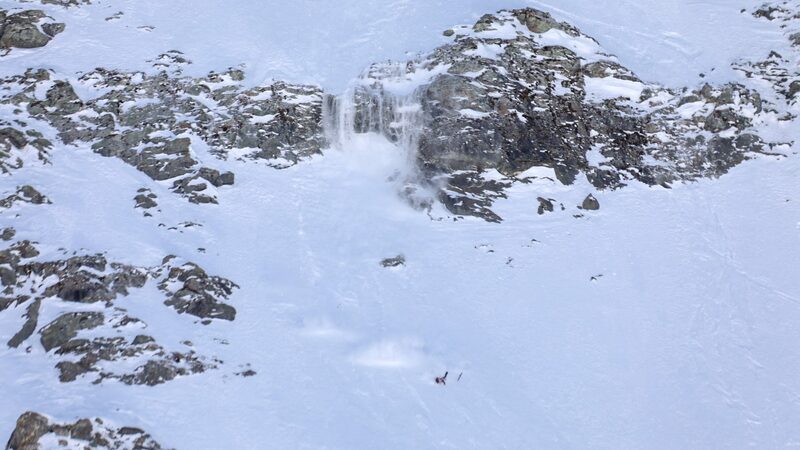 Meanwhile, Mickael Bimboes netted one of the fastest runs down the Bec des Rosses to date. He slashed his way down Central Couloir and soared off the exit air. It seemed like he landed with more speed than he anticipated, and was unable to reach his next feature – he straightlined to the bottom following the hit. After a strong result in Andorra, Kristofer Turdell was in position to challenge Markus Eder for the FWT overall title. The Swede linked a big exit air in Central Couloir with three clean additional features below. But, despite the strong run, Turdell fell short to Gorak’s impressive combo of big-mountain and freestyle features, and landed in third place. Fellow Swede Reine Barkered dropped into Central Couloir from Start 2, combining a large exit air with two additional features, similar to Turdell’s run. The final Swede, Carl Regner Erickson took a brutal fall in a steep and high-exposure area. The crowd watched, horrified, as he tomahawked down the mountain and off a cliff. Fortunately, he seemed relatively unharmed, and was able to ski off under his own power. Following the Italian, Canadian rookie Tom Peiffer kicked out of Start 2 and almost crashed at the top of the Central Couloir. After his initial bobble, Tom talked himself down before proceeding to shred out the bottom. “I said, ‘Nope, you’re not falling’ and stopped and regathered myself,” he said afterwards. Peiffer finished his run with a large air out of Central Couloir and combined a technical double in the more exposed section of the Bec. Leo Slemett brought the fight to the podium, showcasing an unskied cliff line off Start 3, then adding in a 360, a backflip, and lots of smaller features below for good measure. Leo put himself into second, just .4 points behind Wadeck. The last athlete, Aymar Navarro, closed out the competition with another brutal crash, but was also able to ski out under his own power. 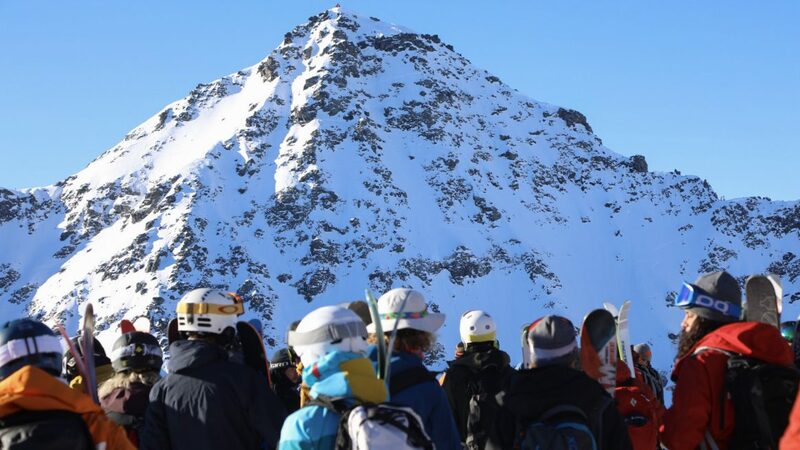 The Ski Men’s Verbier Xtreme podium was Kristoffer Turdell in third, Leo Slemett in second and Wadeck Gorak claiming the win in his first competition on the Bec des Rosses. On the top step, Wadeck immediately and thoroughly showered himself in champagne. The FWT overall standings saw some familiar faces, with Leo Slemett in third, Kristoffer Turdell in second, and Markus Eder claiming his first overall title. “It’s going to be hot in Verbier tonight!” proclaimed the announcers, as the athletes began their celebrations on-hill.